I’ve been extolling the virtues of the Reason Amps Bambino for several months, and how great it sounds. Among the things that I’ve mentioned is that for a little amp, it has a BIG sound. That was a design objective with Obeid Kahn, Reason’s amp designer, when he was designing the amp. He didn’t want to just build yet another affordable, low-powered amp. He wanted to build a great amp. Period. Despite the sound though, what has really turned me on about this amp is its versatility. For instance, last Friday I did my regular, weekly solo gig at a local restaurant. I haven’t been very happy about my Stratacoustic’s tone into my DigiTech Vocalist Live box, so I decided to bring the Bambino to provide some pre-amplification and use its balanced line out to go directly into the restaurant’s board. What I was greeted with was simply put, a spectacular sound, and this from a line out directly from the amp! I’ve mentioned using this in the past, but this time, I had no speaker. I went direct into the board, and the only monitoring I had was from the PA. A couple of days later, I used it for my weekly church gig, with my 1 X 12 speaker cab, and also using the line out to plug into my church’s board. For a church gig, minimal stage volume is important because voices are reinforced through the house audio, not from the band area. So to have this kind of amp where all I have to get is my stage volume, then use the house to get my sound out, it’s simply a boon. The only other amps I’ve ever used that have this kind of versatility are acoustic amps. I realize that there are probably other tube amps that may have this capability, but getting all the great sound and versatility AND boutique quality in a $699 package is just unheard of! If you’re looking for a great amp that’ll work in variety of places, look no further! Some amps were just meant to be used with a certain kind of guitar. The Reason Bambino is one such amp. Mind you, it sounds great with any guitar, and I play it with a wide variety of guitars. But considering the amp designer, Obeid Kahn, and his love of vintage Strats, it’s no small wonder that the Bambino sound absolutely gorgeous with a Strat. You may have already heard a version of this clip when I demonstrated the KASHA Overdrive pedal, but I thought I’d try the lead plugged straight into the Bambino, and adding just a bit of reverb during production. At least for my Strat in the Bambino, pedals? We don’t need no stinkin’ pedals! Volume-wise, this was talking conversation level!!! No EQ was applied to the guitar – what you’re hearing is the raw tone. With respect to “maximum attenuation,” I was in variable mode with the variable sweep pot all the way to its left extent. I shared my amp and PRX settings with Jeff Aragaki this morning, and he estimated that the output power was approximately 0.04 Watt! Many people are apt to talk about how the speaker needs to move air, and that an attenuator doesn’t allow that to happen. But that clip simply demonstrates that with the right combination of equipment – and in my case, also a great set of tubes – you don’t necessarily need that speaker cone breakup to get great tone for recording purposes. Yes, SPL’s do play a big role in your overall tone, but to be able to achieve the kind of tone I was able to get at that very low volume level is nothing short of amazing! So what about an attenuator being life-changing? Maybe that’s a bit strong of a phrase, but ever since I’ve been using attenuators, and especially since I’ve gotten my Aracom PRX150-Pro, I’ve been able to explore tonal territory that I could previously only achieve using pedals – and only simulating at that! Take overdrive pedals for instance. If you’re a regular reader of this blog, you know I’m crazy about them. I probably will still be nuts about overdrive pedals, but there’s one thing an overdrive pedal can’t do that an attenuator allows me to do, and that’s to get the thick, natural overdrive tone of my amp. Don’t get me wrong, I still use them, but I use them now more for tonal accents to my drive tone rather than giving me my drive tone. That’s very profound; especially for an overdrive pedal freak like me! Here’s a good example that I just recorded. This clip is part of a new song idea I’ve been playing around with. Setup is pretty much the same as above, but for the rhythm, I’m running Strat into my Kasha overdrive pedal to get a jangly, crisp tone. The lead is Goldie plugged straight into my VRX22. I did mix and do a simple master on the recording, but the guitars were all recorded raw, with no EQ. In my DAW, I added some reverb to both parts and a touch of delay to the lead, but that’s it. Speaking of pedals, since I’ve started using a high-end attenuator (there are others such as Alex’s and the Faustine Phantom), I’ve actually started using pedals in general much less. I’ve really relying on the natural tone and sustain of my amp. For instance, I’ve found that I’ve only been using reverb in the studio. When I play out, I just don’t bother. In fact, for the last few weeks, I’ve only been taking two pedals to gigs with me: My BOSS TU-2 Tuner and my VRX22’s channel switcher. Same goes with my Reason Bambino. Life-changing? Probably not, but definitely approach-changing. I may personally endorse the PRX150-Pro, but there are others out there. If you really want to hear what your amp has to offer when it’s fully cranked with the power tubes glowing, then you owe it to yourself to get a good attenuator! Get a Big Sound With Re-amping! For a long time, I’ve had this thing for getting a big guitar sound in my recordings. I’ve done a bunch of different things like doubling, overdubbing, signal splitting between two amps, and the like. But recently, I got a couple of pieces of gear that is allowing me to explore yet another way to get a big guitar sound: Re-amping. Re-amping is essentially taking an already amplified guitar signal, and running it through another amplifier. This is not like adding a gain stage because that usually involves multiple pre-amp sections. With re-amping, you’re building on a fully amplified signal that has passed through the power tubes. The result is VERY different in tonal character from just moving the signal through another gain stage. There are lots of ways to re-amp, so I won’t go into a lot of detail. But I will share how I do it. 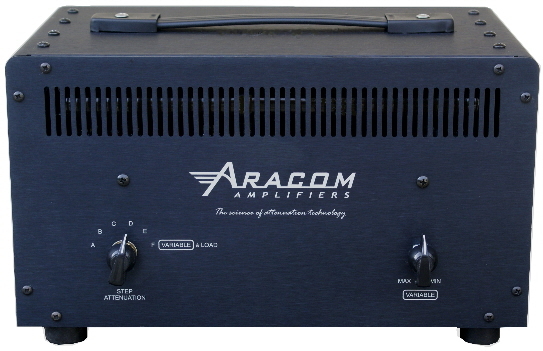 Ever since I got my Aracom PRX15-Pro, I’ve been contemplating this very thing because of its line out which could be used in a variety of ways; such as running the signal into a PA (since it’s unbalanced, you need a DI box), or taking that line level, and running it into another amp to re-amplify the signal yet again. The cool thing about the PRX150-Pro is that I can simultaneously run an output to a speaker, then the amp that’s doing the re-amping can also have it’s own audio output. Now here’s something even more cool! I have a Reason Bambino, which also has a line out. It’s a balanced line out, so it can go directly into a board, and doesn’t need to be hooked up to an external cab. The tone coming from the line out of the Bambino is very nice. I suppose that I could’ve miked the Bambino from another cabinet, but I did want to test the line out. In a nutshell, I plugged my guitar directly into my Aracom VRX22, which ran into the PRX150-Pro. I hooked up an external cab to the attenuator, placed a mic in front of the cabinet that ran into Channel 1 of my audio interface. Then, I ran the line out of the attenuator to the input of the Reason Bambino. From there, I went directly from the Bambino into Channel 2 of my audio interface. Note that this is a kind of a different way to employ re-amping, which basically runs two amps in a series then out a single output. The way I employed it, the re-amped signal is a component of the overall package. Cruising the forums this morning, I came upon a statistic that just blew me away; probably more so because I completely missed it when it first came out. But better late than never… Anyway, the guys at Creation Audio Labs did a loudness comparison of various amplifiers in different wattage ranges at the recent Nashville Amps Show. For the 1 – 20 Watt category, the Reason Bambino had a loudness of 120.2 dB through a Greenback! That’s moving some serious air for an 8 Watt amp, and just goes to show you that’s it’s not necessarily wattage that determines how loud something is. Power handling is the key, and Obeid Kahn of Reason Amps is wizard with power handling. I’ve been extolling the Bambino not only for it’s great tone, but also for how loud it can go. Friends have said an amp this small will never move enough air to gig with; I’ve proven them wrong time and again, but mostly through verbal argument. But now, with a number to back up the argument, I can confidently say that this amp can do it! I regularly use it for gigging with my 1 X 12 cabinet, and have absolutely no problem hearing myself over the drums. But let’s be clear: I’m not using the amp to project my sound out to the audience. I’m using it more as a direct stage monitor, of which it is PERFECTLY suited. I get my sound out to the audience by plugging directly into the PA board from the balanced line out, or miking my cabinet. Circling back to the Bambino, it is a great, versatile amp that is really starting to turn heads; not just from its tone, but how well it can project its voice! I spoke about Tone with a capital “T” the other day and how your Tone is the combination of your gear plus what’s in your heart. One thing that I didn’t discuss is that when your heart and your gear are in alignment, the visceral effect it has on you borders on a religious experience. Put simply, you become truly inspired. I got Goldie back from Saint Guitars a few days ago to correct some wiring and action issues, and plugging her into my amp, I was immediately floored by her tone. I already was in the first place, but with everything working right, the effect it had on my spirit was tremendous! 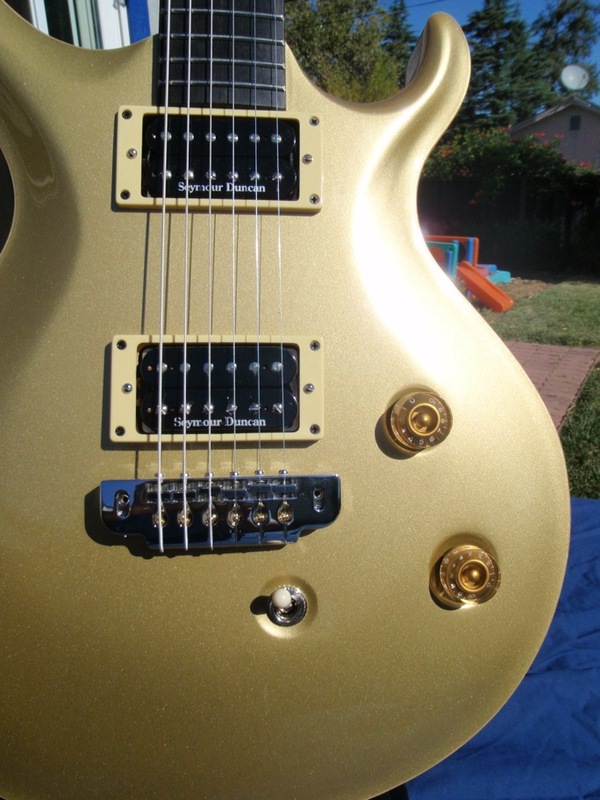 The opening of the song and the first “verse” demonstrate Goldie’s neck pickup in single-coil configuration. Man, it’s chimey like a Strat! The second part of the song stays in the neck pickup but with both coils working, and adding a bit of crunch in the second channel of my Aracom VRX22. I recently had a mod done to the amp to add channel switching, and remove the Master Volume control from the first channel so it acts more like a Class A amp in channel 1. Continuing on, in the bridge of the song, I switch both pickups and remain in channel 2, then I finally finish up back on the neck pickup. I can’t believe the sounds that come from this guitar, and my VRX22 just sounds so sweet with it! By the way, as far as the recording of the melody goes, I recorded Goldie completely dry, just plugged right into my amp. I then added some reverb and a tiny bit of delay to give the melody an airy feel. The rhythm part was recorded using my Strat directly plugged into my Reason Bambino and played entirely in the Bambino’s Normal Channel. I love the natural presence of the Bambino – it was if it was made for a Strat! I also recorded the entire song at bedroom level using my Aracom PRX150-Pro attenuator. I just love the purity of my tone at any volume level!